Well, hello, hello!! Can you believe it’s the 10th of the month, already?? Our bunch of 10 bloggers is so happy to be back, sharing with you ten brand new ideas. This month we’ve turned our thoughts to our kiddos! 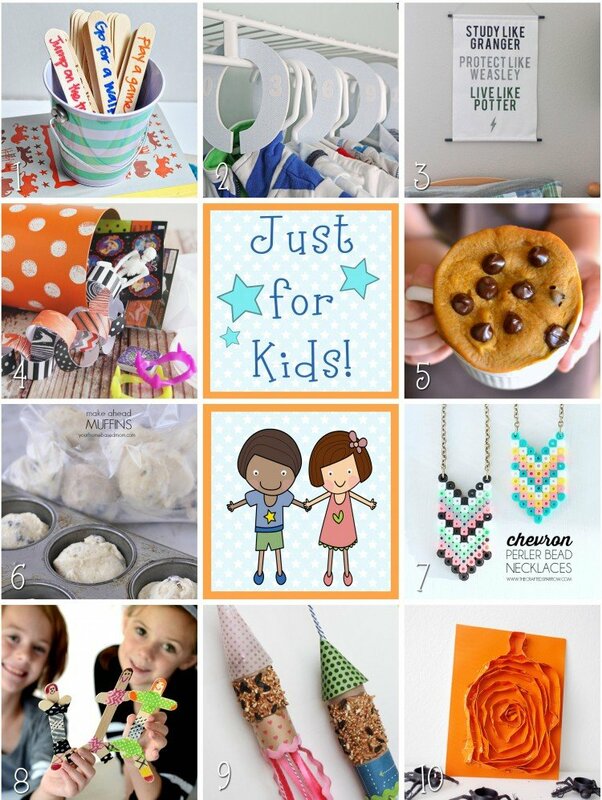 Our chosen theme is JUST FOR KIDS, with ten great ideas, for and all about kids, including recipes, crafts, and all-around great ways to bring the family together. After you check out my super cute Craft Stick Dolls, be sure to check out (and pin!) the posts from my fellow blog friends. Enjoy! My girls love to make things, and often they’re borrowing my craft supplies to create their latest project. Last week they asked for craft sticks and washi tape, and I am in la la love with what they came up with! When I saw their darling Craft Stick Dolls, I wasexcited to share this easy & FUN craft for kids! I am in love with how creative kids can be with this project–think of all the fun possibilities! They could make dolls to match story characters, their families, a favorite show, or their own creations. They are SO easy and fun to put together (adults, make sure to help with the cutting! ), you might be surprised to see how many you end up making! 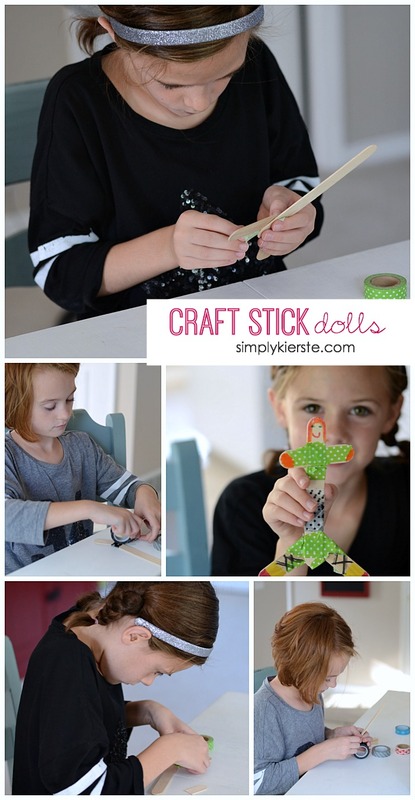 Here’s how your kids can make their own craft stick dolls! 1. You will need three craft sticks per doll. One stick will stay whole, and act as the body of the doll. One stick will be cut into arms, and the other for legs. With ADULT HELP, cut from the ends of the stick (so you’ll have the round ends as part of each arm and leg) the length you want the arms and legs to be. Please make sure adults are doing the cutting–you have to use a little extra force to go through the craft sticks. I used kitchen scissors, since they were more heavy duty, and had slightly serrated edges that helped go through the craft sticks. 2. Use pieces of washi tape to attach the arms and legs to the craft stick doll body. My girls went crazy with the tape…lots and lots of colors and patterns! 3. The final step is to add a face and hair, using markers and crayons You could also use other textiles to create hair and clothes if you wanted to–whatever you want to do! You’re ready to play! These are perfect for a rainy day, or any time your kids are itching to get creative. super cute + easy = win!! My girls would LOVE making these!! !